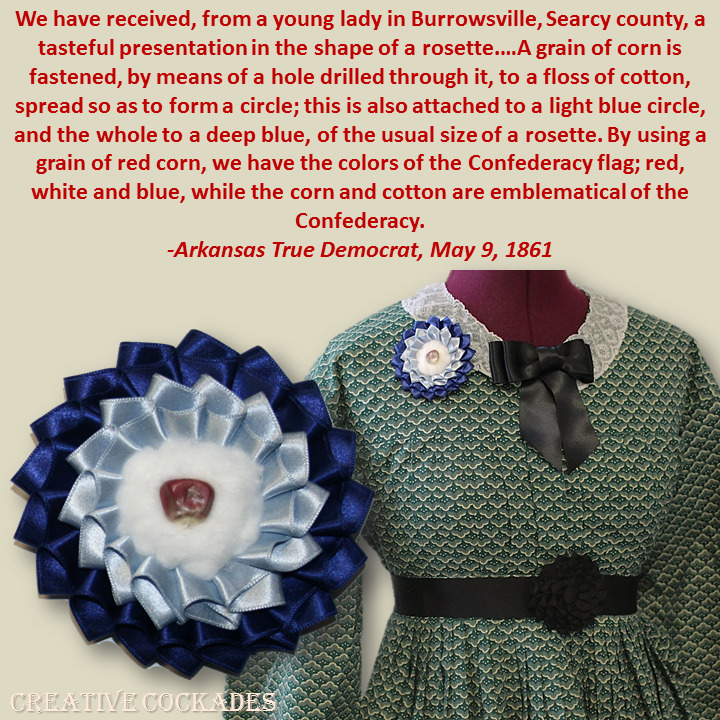 Designed by a Confederate Arkansas girl, this stunning cockade is southern to the core - red corn and white cotton, with the blue of the Confederate flags for a backdrop. 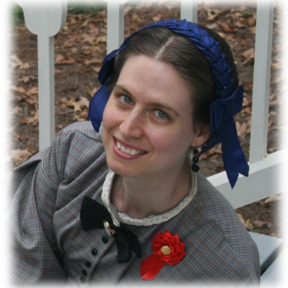 Wear for any patriotic event, or wear as a Confederate reenactor. Appropriate for both gentlemen and ladies. Approximately 3" (7.5 cm) across rosette. Pin on back is silver-plated and 1" (2.5 cm) wide. Corn kernels are real and may vary slightly. 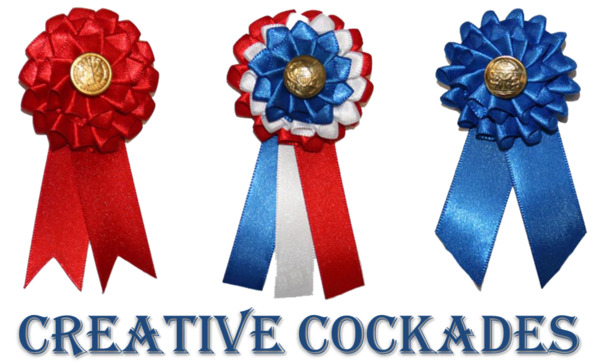 "Neat and Appropriate.—We have received, from a young lady in Burrowsville, Searcy county, a tasteful presentation in the shape of a rosette. It is so simple and pretty that we will endeavor to describe it. A grain of corn is fastened, by means of a hole drilled through it, to a floss of cotton, spread so as to form a circle; this is also attached to a light blue circle, and the whole to a deep blue, of the usual size of a rosette. By using a grain of red corn, we have the colors of the Confederacy flag; red, white and blue, while the corn and cotton are emblematical of the Confederacy. The design and execution are both excellent.—The present was sent with a patriotic note from the true hearted donor. In the revolution of '61 as in '76, the women are on the side of truth and liberty and, if need be, will show themselves to be heroines as did their foremothers. God bless them and the Southern Confederacy."